This Circle Venice earrings studs punctuate the ear is is a contemporary interpretation of the classic doily design. Is a everyday piece that you'll forget to have it on thanks to its super light weight. This design combines 3D technology with an artisanal approach. Inspired by Teneriffe lace Francesca's family items. Variances of colours and layering are due to the 3D printing, polishing, dyeing and finishing handmade process. Shell earrings respond to those who wandered how it feels wearing a sculpture. 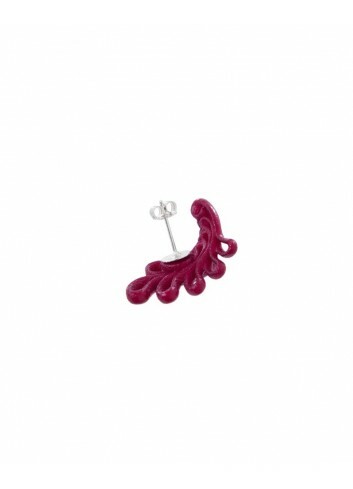 It's one of the most three-dimensional Paolin earrings and you can wear has your every day signature piece. This design combines 3D technology with an artisanal approach. Inspired by a travel in the past where old forgotten items like Venetian laces and embroideries have gone through the mutation of the time. Variances of colours and layering are due to the 3D printing, polishing, dyeing and finishing handmade process. Necklace in Polyamide 3D printed and hand dyed. This design combines 3D technology with an artisan approach. Inspired by ancient memories and far-away cultures. Variances of colours and layering are due to the 3D printing, polishing, dyeing and finishing handmade process. The material used is flexible and lightweight. We had fun making it, have fun wearing it! 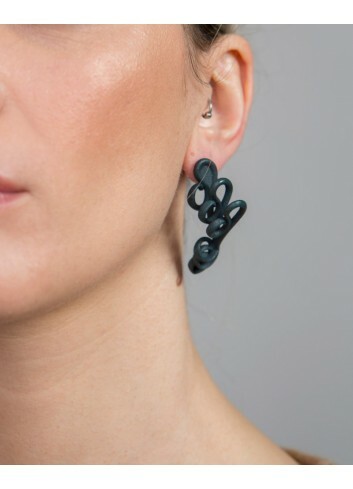 Earrings in Polyamide 3D printed and hand dyed. Variances of colours and layering are due to the 3D printing, polishing and the artisanal approach. This design combines 3D technology with an artisal approach. Variances of colours and layering are due to the 3D printing, polishing, dyeing and finishing handmade process. 3D movement picture, everyday ring. With the Butterfly ring Paolin capture the butterflies movement in a three-dimensional shot and give it to you in a everyday ring. No metal parts in this item. This design combines 3D technology with an artisal approach. Inspired by teneriffe lace Francesca's family items. The lace become the framework for a modern reintertretation of this antique technique. Variances of colours and layering are due to the 3D printing, polishing, dyeing and finishing handmade process. Everyday This design combines 3D technology with an artisal approach. Inspired by teneriffe lace Francesca's family items. The lace become the framework for a moder reintertretation of this antique technique . Butterfly earrings capture the butterflies movement in a three-dimensional shot. Post back closure in silver-tone brass. 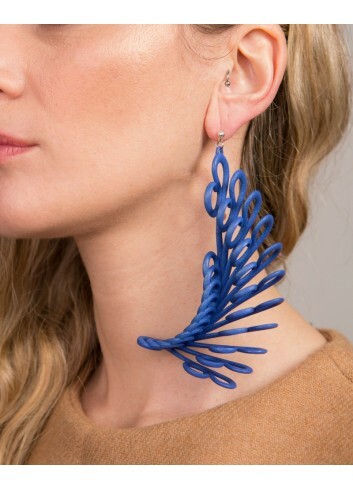 Earring in Polyamide 3D printed and hand dyed. This design combines 3D technology with an artisal approach. Inspired by a travel in the past where old forgotten itemes like Venetian lace s and embroideries have gone through the mutation of the time. Variances of colours and layering are due to the 3D printing, polishing, dyeing and finishing handmade process. 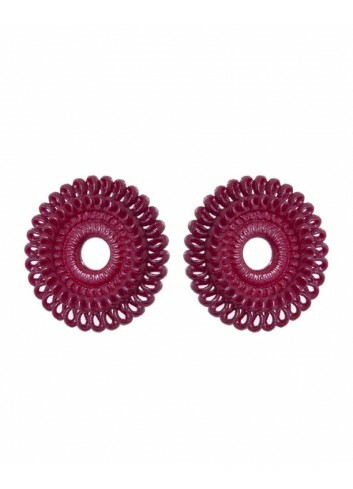 Fiocco earrings is a everyday signature piece that make your look unique. It's a visionary interpretation of the bow. Earring butterfly backs in silver-tone brass. This design combines 3D technology with an artisanal approach. Variances of colours and layering are due to the 3D printing, polishing, dyeing and finishing handmade process.